Maria Karakosta-Humpich, MA, RSMET, CMT, is an innovator in the field of human consciousness, holistic therapies, somatic practices and change support. After a Master of Arts in French literature and studies in education sciences, she turned to dance and fitness training. For more than 20 years, at the crossroads of eastern and western cultures, she has dedicated herself to somatic therapies, healing arts, trauma resolution (P. Levine), hypnosis, neuro-linguistic programming (NLP), therapeutic yoga and holistic approaches of the human being. In 2006, meeting Emilie Conrad and discovering Continuum Movement® opened totally new pathways for giving support to people under stress conditions and/or facing changes in their personal or professional lives. Primordial breaths, sounds and wave motions became a key factor for healing inner imprints of past traumas and freeing oneself from conditionings and mechanistic constraints of today’s society. In individual or group sessions, Maria is now teaching Continuum Movement for creating deep health and wellness as well as body-mind-spirit integration. Based on her in-depth knowledge and practice of different yoga systems (Asthanga, Anusara, Sridaiva), she innovates in creating Continuum yoga classes in which the power of breaths, the bio-intelligence of the fluid system and an inhabited relationship to gravity contribute to expand one’s freedom of movement, elasticity, strength and sense of wholeness. Combining her professional experience of fitness, her knowledge of fascias and living body anatomy with the principles of Continuum Movement, she creates Continuum fitness classes, offering cutting edge exercises aiming at revitalizing forgotten areas of one’s own body, strengthening muscle efficiency without harming or shortening soft tissue fibers and providing students with a creative way of empowerment. Her experience of massage and fascial hands-on work led her to offer a manual approach that combines touch, primordial breaths and participation of the client/student in their path on recovery from chronic pain, deep fatigue, stress condition by supporting homeostasis. By increasing perceptual sensitivity and helping redefine one’s sense of self, Maria’s work aims at developing the client/student autonomy. She leads training programs in holistic massage and co-created the Heart of touch program, for professionals wanting to enhance their hands-on skills or for individuals open to discovering experimental sense-experienced anatomy, fascia tonus self-regulation and body-mind-spirit integration. Maria is specifically addressing women needs too, helping them reconnect with their true nature through “sacred feminine” workshops. 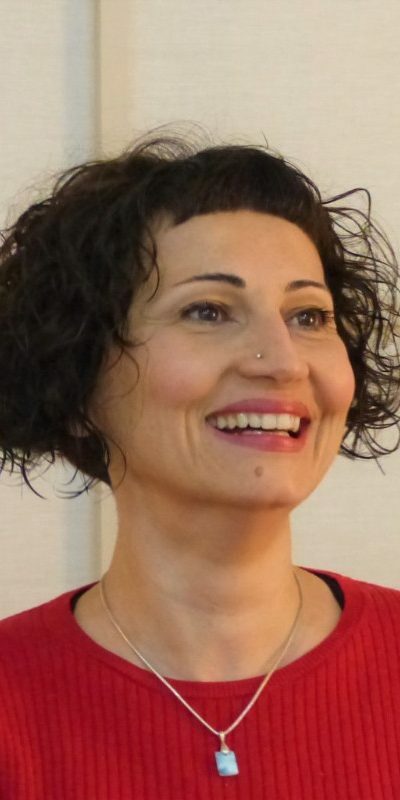 Member of the International Somatic Movement Education and Therapy Association (ISMETA) and based in Athens (Greece), Maria is offering private sessions in-person and online, as well as group classes in Greek language, and also in French and English. From 2018, Maria is supporting the organization of upcoming Continuum Movement Workshops in Greece (Continuum Movement Training Program), under the direction of Donnalea Van Vleet Goelz, for participants coming from all around Europe and North America.